With "Common Ground," Chapin delivers his first new studio release in nearly a decade -- and it's a masterpiece. From the anthemic title track to the bluesy "Not Tired of Love" to the humorous "Martha & Oprah," each track hits the mark. 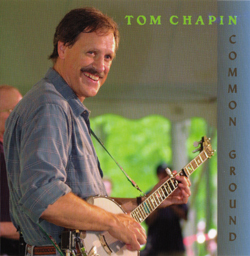 Chapin, known for almost three decades now as a hard-working road warrior performing 150-175 shows per year, has one of the most wide-ranging audiences in the business: from the younger generations who know him from his family recordings, to older folk and folk/rock aficianados who are more familiar with his adult-oriented recordings.